I know this has been hashed over in the past but need a new clear perspective and advice. 2007 C6, Auto, LS2, Convertible. But,,, I definetly need more sound from the stock exhaust and soon! I don't want a drone - Not too loud but a bolder, louder performance sound needed bad! Mufflers ONLY - Your experiences, advice, BRAND & PART #'s please. I was in the same position but went ahead and tried modding the stock muffler since I would be throwing my mufflers away anyway. Came out fine for me. It's bassy and rumbly but not loud. It sounds like a mean V8 instead of a whisper. Now I'm going to skip to headers and get a real gain instead of blowing cash on an axleback. Last edited by Oic0; 04-13-2019 at 01:15 PM. so what have you done to get more sound from the stock mufflers. I don't know if Corsa sells the mufflers alone but I have the Corsa Sport on my stock C6 and they do just what you want. I also have Borla Stingers in my modded C5 and they are just what you DO NOT want LOL. Heavy Drone ~1500-1900, LOUD all the time. Ive heard from others that Corsa doesn't sell mufflers separately? True? Search here for stock muffler mod. It involves cutting a couple holes in certain spots and patching the hole. I have the same Corvette and went w/ Borla Touring. Louder than stock but not much. The next loudest Borla model are the S-Type. I would like to hear the S-Type mufflers on a C6 Corvette, but I'm okay with my Touring model choice. They look way better than stock mufflers. I had the same car except mine was a coupe which is more prone to drone and I still didn't have any issues after patching up the holes post muffler-mod. The best money I spent! It gave my car the burble sound on deceleration and more growl. I had Magnaflow mufflers installed and tips welded back on. Around $300 I have drone and it sounds great to me ! The following users liked this post: Richard G.
Send a private message to Richard G.
Find More Posts by Richard G.
I put a Borla S classic (Stinger) on when I bought my car last year. Rest of exhaust is stock. I like it it but when I do headers next year, I will put the original mufflers back on because it will be too loud for my tastes with the headers. If it is too quiet, I’ll do the muffler mod to get the sound I want. Stock Bi Mode NPP exhaust mufflers is the way to go for you my friend. These give you a range of options. A) Open will drone in that dreaded RPM zone but have that deeper aftermarket sound. B) Closed for whisper quiet, no drone, and boring as hell(in my opinion) C) Partially open just a crack, no drone, nice crisp sound( you can use a speed nut at the edge of the butterfly(easiest), just slide them on with needle nose plyers) or collars(much harder due to tight fit area). 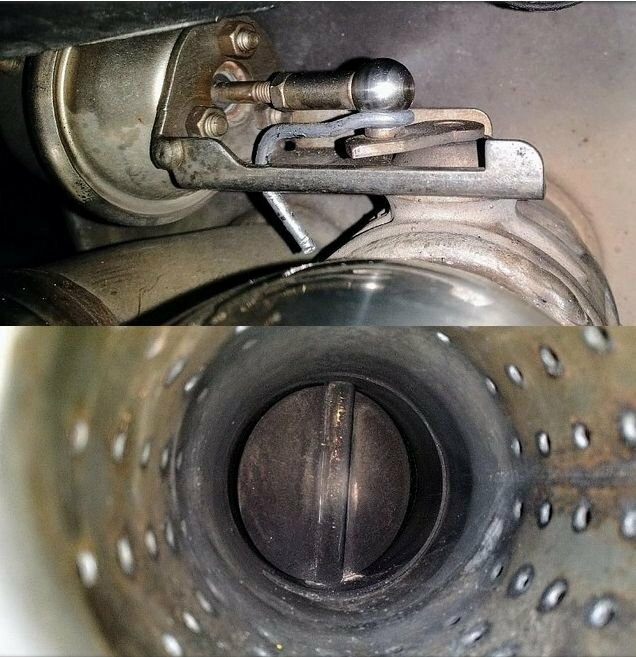 If your Vette doesn't have the NPP plumbing and you can't afford the aftermarket NPP in a box, you still have choices... either to leave them open which mode they default to, or you can wire them partially closed(speed nut or collars) or wire them all the way closed. I went the Goldilocks route and started with the Bi Mode NPP mufflers only in the totally open, default position... Too loud! Then I wired them totally shut... Too quiet! Then I added a speed nut to each butterfly... Just right! I ended up buying the NPP in a box to get the best of both worlds at the push of a button, cause sometimes you want to sound bad ***, and sometimes you want a "little" peace and quiet without being boring! I used coat hanger wire to close butterfly. They are spring loaded with a lot of tension. Some have used zip ties but I thought they wood melt. Thankyou for all the work you did with pics and all. I dont have NPP on my car so the price of buying it all would likely be out of my budget for this year. Thanks tho! Jim, unless you have the $500 to $1700 to spend on fancy axle backs that are purty, but do nothing for performance, just do the recommended muffler mod. Drill the recommended holes, cover with the correct size snap-in plug from Home Depot. Better sound, no drone, and cost about $10. If at some point you want the others, or something else, no wasted money. Thankyou for your reply! I like the price of that option. What are the plugs called? Question: If the holes are plugged how does it make more noise? You are boring through the outside skin of the muff, and through the core. You are then plugging the outside skin. The core then vents the pulses directly to the outside skin, which gives it more rumble. If it is not loud enough, you can later remove the plug and pull out more glass. The size of the plug will be determined by the size hole you choose. A friend of mine did 1.5" because it was easy to find pop-in plugs for. I have heard of people who decided to remove all the glass they could, and leave the plugs out. Lots of options. Do not attempt to do the mod until you have completely read the directions. I believe it has been cited in the thread you started.